Microsoft MCSE Certification validates your skills in designing, implementing and maintaining Windows Server 2000-2003 based foundations. Prior MCITP and MCTS certifications available; the MCSE certification was go-to credential for tech professionals specialized in implementing and maintaining Microsoft technologies. Microsoft MCSE certification package authenticates your proficiency in designing, executing and managing corporates infrastructures running Windows Server 2003 or Windows Server 2000. Becoming a Certified Systems Engineer demonstrates clients and employers that you can design, implement, and maintain infrastructures specifically based upon Windows Server platform. This involves installing, troubleshooting networks and using Active Directories. Earning an MCSE certification allows you to both manage an organization’s Active Directory and make strategies for its forthcoming development. Although Windows Server 2003 and 2000 are close to ending point of their product life cycle, the MCSE certified professionals still entails value as several companies are still using common Microsoft technologies. It also offers upgraded exams thus MCSE certification holders can rapidly earn the more recent MCITP and MCTS certificates. Get employed, show clear-cut impact of business, and boost your technical abilities with Microsoft certifications. Microsoft offers a widespread range of certification programs can help you to take your career path to next level. A Microsoft Certification authenticates your experience in Microsoft technology. Passing out your initial Microsoft exam inevitably makes you a member of MCP community, with an access to all of benefits offered thru Microsoft certification program and private Microsoft Certified Professionals (MCP) member website. Microsoft MTA certification course is a highly fascinating place to start. Microsoft considers MTA certification as an entry-point certification for those candidates who are strengthening their career path in information technology, looking to boosts your understanding regarding fundamentals, or if you are noticing a change in your existing information technology career path. MTA certifications package provide professional certifications on products pertinent with Microsoft and they deliver fundamentals for MSSQL Server, Visual Studio and IT based Infrastructure such as Windows and Windows Server. MCSA is an up-to-the-minute certification program suitable for candidates seeking for entry level jobs in information technology milieu. MCSA is a criterion for advanced level Microsoft certifications. Merely put, Microsoft MCSA is a certification of middle level which you can get between your MCSE and MCP course. A typical MCSA certified must have 6 to 12 months of experience in information technology field prior chasing this certification. In order to become a MCSA certified expert, it is mandatory to pass 3 basic exams and one optional exam. An MCSE Certification is a certificate to become a system administrator. They are a sequence of exams that check an individual’s knowledge with several Microsoft Servers like Windows, Exchange Server, SQL Server, Lync, SharePoint and System Center (SCCM). For whom MCSE Certification designed? 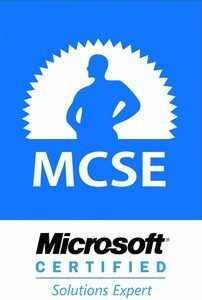 MCSE course is an advanced-level credential offered by Microsoft. It is a part of MCP certification programs taken by candidates to validate their expertise and knowledge on some of the most renowned Microsoft services and products. An MCSE certification course provides validation that a certified professional is practiced to perform a number of crucial IT related tasks using Microsoft technologies fruitfully. This Microsoft exam course offers training in administering and deploying technology based enterprises solutions along with optimizing and operating such solutions. MCSE Productivity – Exchange Certification 2016 Courses: It requires candidates to take comprehensive knowledge about Microsoft Exchange Server including topics like managing, deploying and administering advanced and core aspects of Exchange Server 2016. MCSE Productivity – SharePoint Certification 2016 Courses: This exam course includes topics concentrating on applying higher availability, service application architecture, disaster recovery, social computing features, business Connectivity Services, collaboration and productivity platforms as well as features. MCSE Server Infrastructure: With an understanding of networking, systems handling and storage, this exam course prepares candidates to design and develop server solutions for infrastructure. MCSE Desktop Infrastructure: This exam course equips candidates to organize and deploy desktops by making use of Microsoft technologies, along with managing their security and performance. MCSE Private Cloud: This course enables candidates in executing and maintaining private cloud-based Microsoft infrastructure. MSCE Enterprise Devices and App: This exam course helps candidates in learning how to support, deploy, configure and administer several enterprise apps and devices. MCSE Data Platform: By taking this exam course, candidates learn to figure and maintain data-based solutions and cloud-based infrastructures. MCSE Business Intelligence: By passing out this exam, candidates will be capable of designing and delivering proficient enterprise BI solutions. A typical MCSA certified expert must have 6 to 12 months of practical IT experience prior taking this exam. In order to achieve this certification, it is compulsory to pass out 3 fundamental exams and one non-compulsory exam. For further details regarding MCSA prerequisites you can read thoroughly official Microsoft requirements. Servers and computer networking related concepts Protocols such as TCP/IP Interactive databases A+, Active Directory, N+, SharePoint, DHCP and DNS. Microsoft MCSA certification is an outstanding stepping-stone toward ultimate objective of becoming a professional MCSE certified, if that is your selected career path. In case you haven’t any plan on designing and developing networks, you can skip taking seven exams require for MCSE and get MCSA with only 4 tests. One advantage of pursuing MCSA certification first is that if you decide to go for MCSE, all MCSA courses will count on the way to MCSE. You’ll only need to take 3 supplementary tests. By means of taking MCSE certification programs, individuals can gain advanced level skills that expose in the form of substantial business impact. This can ultimately boost your career as a certified IT pro who can manage a number of complex business applications comprising the usage of Microsoft technologies.